What is the point, I often ask myself, of running a food blog and reading other food blogs, if you don't learn from each other in terms of recipes and new places to go for good food? Having said that, I should admit with great regret that I haven't yet managed to try a fellow flogger's custom recipe, but that's mainly because I have so many of my own to try. On the recommended restaurants front, though, I am doing slightly better. After Cheryl the baker repeatedly plugged Miss Clarity Cafe, inundating them with outstanding reviews, I decided I had to take a trip down to see for myself this jewel of the Orient. Unfortunately, circumstances conspired to prevent my visit for months, until I discovered, to my great surprise, that one of my colleagues is part of the family that owns the cafe; in fact, he's Clarity's brother. With a pedigree like that, how could I not go? Still, it was some time more before the opportunity arose to take a gander at this cosy little eatery. So last Saturday, it was decided that Eugene's birthday should be celebrated there, allowing me to kill two birds with one chicken ballotine. 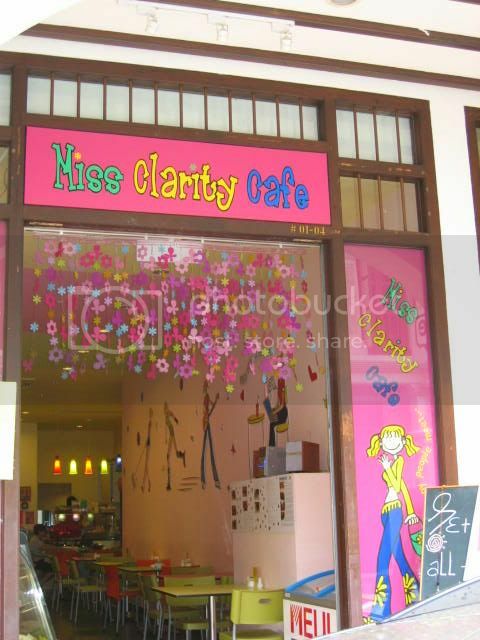 Located along Purvis Street, almost directly opposite Yhingthai Palace, Miss Clarity Cafe is kind of hard to miss. The cafe can accomodate about 50 people, and while I must admit the decor is a little kitsch for my slightly pretentious tastes, it does work; within half an hour all the empty tables you see in the photo were filled. Of course, this may also have had something to do with the affordable prices. Miss Clarity Cafe has an impressively extensive menu; it offers three set lunches ($8.80, $12.80 and $15.80), pastas, white meats, red meats and seafood. The entire menu spans something like eight pages and more than fifty items. All three of us had the $8.80 set, which includes a soup/salad, main course, dessert and drink. 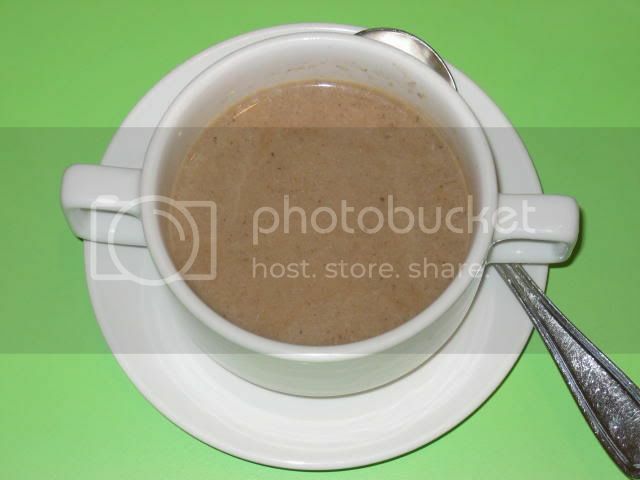 The soup of the day turned out to be mushroom soup, which was, unfortunately, rather lacklustre (2/5). It was quite diluted, and (I suspect) contained some MSG, without much mushroom aroma at all. [Ed: Nora has assured me that no MSG is used in the preparation of any of the cafe's food]. I decided to replace my drink with a chocolate milkshake ($3.50), simply because I'm a sucker for chocolate milkshakes and wondered if, in addition to being one of the cheapest milkshakes in Singapore, this would be my elusive answer to the best milkshake in town. Unfortunately, it proved not to be so (3/5), as it wasn't chocolatey enough, but at that price you won't find me complaning. I've had worse for twice the price. 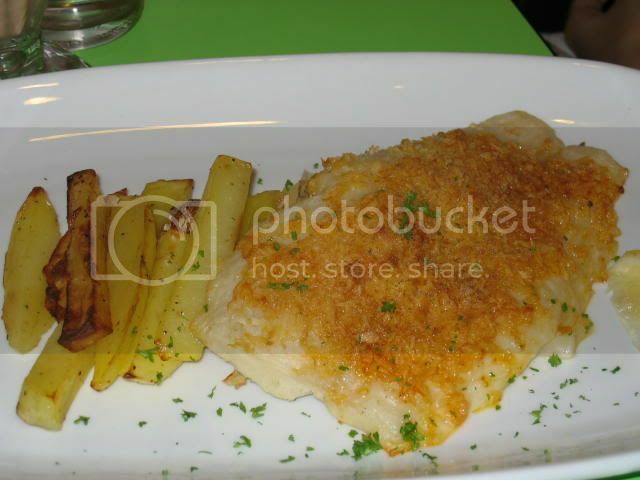 Liwern had the garlic-crusted dory, which, although I'm not a big fish fan, did seem quite good. I didn't really taste the garlic though, which one imagines is the dish's defining attribute. 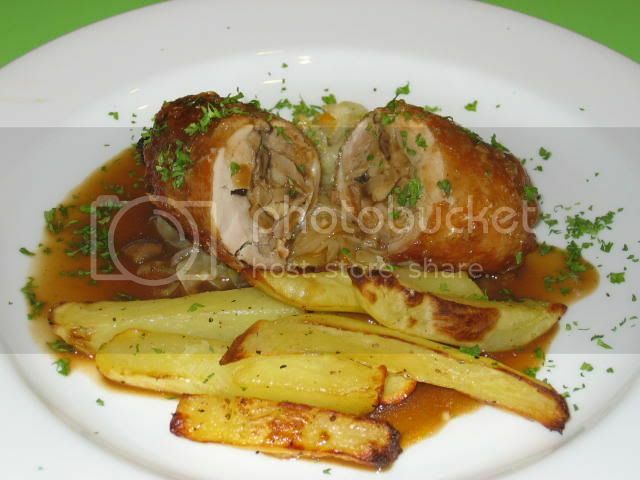 I couldn't decide between the chicken ballotine and the chicken cordon bleu, which Eugene eventually had, but in the end I decided the chicken ballotine sounded healthier. The chicken ballotine was actually quite nice (3.5/5), but I was somewhat less than impressed with the accompanying fries baked potatoes and vegetables, which seemed a little soggy. It didn't occur to me at the time, but I realise now, after looking at Cheryl's previous posts, that the portions at Miss Clarity Cafe have definitely become smaller, and that prices have gone up. 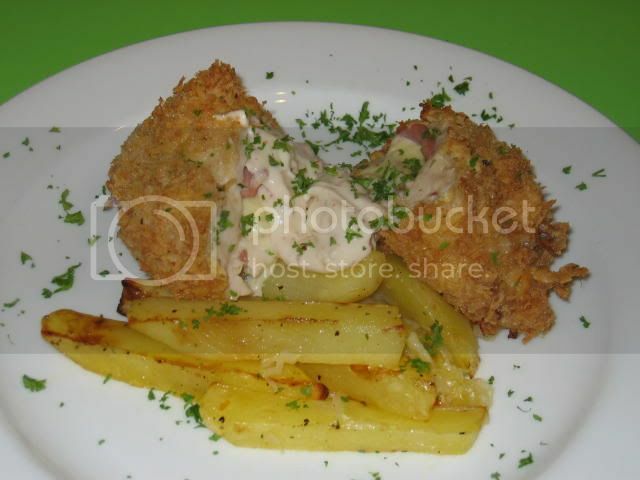 Instead of the $5.50 Cheryl quoted for her Chicken Cordon Bleu, it now costs something like $7.00. While the prices are undoubtedly attractive, the cafe's location in Purvis Street makes it a little inaccessible unless you happen to be in the City Hall/Bugis area. Also, while the boss lady, Nora, is extremely friendly and chatty, some of the service standards need to be improved a bit. For instance, the bill lumps every order together under one total price, so you have no idea what you're paying for. This is going to be a rather strange review of La Braceria, considering we brought most of the ingredients rather than having the restaurant provide them. Still, we judge a restaurant on the dining experience it provides, not on the food it is capable of procuring. So the story behind this dinner is that my parents recently went to Tuscany on holiday, and being good foodie parents, brought back some nice epicurean delights. 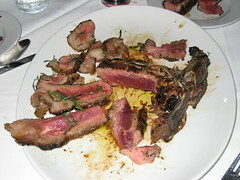 Among which were an assortment of olive oils and basalmic vinegars, a truffle/porcini tapenade that I am going to eat up very quickly, and best of all, some bistecca alla fiorentina. 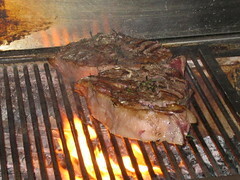 The Fiorentina, or Florentine steak, is an enormous porterhouse steak. It includes generous portions of the toploin and tenderloin muscles, attached by the very distinctive T-bone. 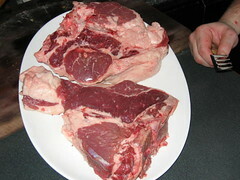 The steaks weighed in at about 2kg each, and apparently each cow only produces 8kg. The most famous purveyor of the Fiorentina is Dario Cecchini (who apparently spouts Dante as he slices up his meats) and he refused to let my parents have more than 4kg worth. Apparently the steak needs no seasoning, and only a few minutes on a grill. To be consumed no more than medium-rare, obviously. So dinner was organised, and my father originally suggested Au Petit Salut as the venue, but it was decided that only an Italian restaurant would be able to do justice to a Florentine steak (something my father could not understand, but then again he's never been much of a food purist), so La Braceria was settled upon. The restaurant boasts an authentic grill and pizza oven (alas, not wood-fired), so it is with good reason that their grilled sausages (home-made, of course) and pizzas enjoy such fame and acclaim among the diners who've sampled them. 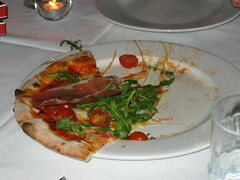 We had two orders of pizza, to share among thirteen or so of us as appetisers before the real thing. 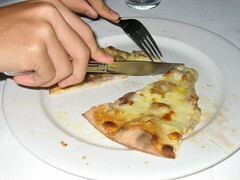 Pizzas at La Braceria are typically more expensive than similar offerings from other pizza parlours, averaging $20++ each. The price though, isn't the main issue; it's whether the food is worth what you're paying. In this case, I'm inclined to believe it is (4/5). The pizza ingredients and toppings are generous, decently-sized and well-prepared in that nice oven you see as you enter the restaurant. Not a dish you'd usually find in the restaurant; the pasta was a simple tagliatelle tossed with olive oil and served with shaved white truffle which was yet another artefact of the Italian trip. Now, I'm going to go out on a real limb here, and say that frankly, truffles don't do much for me. I know they're considered to be the pinnacle of fine dining and the mere aroma of them is enough to send some people into quivering ecstasies, but personally I think it's slightly criminal to be paying so much for a fungus no larger than most polyps. While I fully appreciate their incredibly enveloping fragrance, I'd rather take the much more economical porcini. Does that make me plebeian? Perhaps, but then again, I never claimed to be anything more than slightly pretentious. In any case, the pasta disappointed me, as it was rather severely under-salted, so it's probably a good thing that it's not on the regular menu. And now, the moment you've all been waiting for. We so often get such puny slices of meat here that we've become conditioned to thinking that steaks only weigh two to three hundred grammes each. The monsters beauties you see here weigh in at a hefty two kilogrammes each, and are about the size of a large dinner-plate. 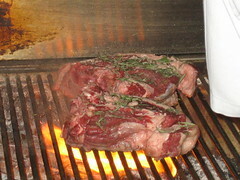 There's very little marbling, as compared to something like Wagyu, so there were some concerns as to tenderness. Now, there's a whole ritual involved in the preparation of a Bistecca alla Fiorentina, though I suspect this is more likely part of the showmanship that gives Dario his reknown. It's billed as "one of the most supreme physical pleasures in this earthly life", and only needs to be grilled five minutes per side, then fifteen minutes on its edge before being consumed without any other seasoning. 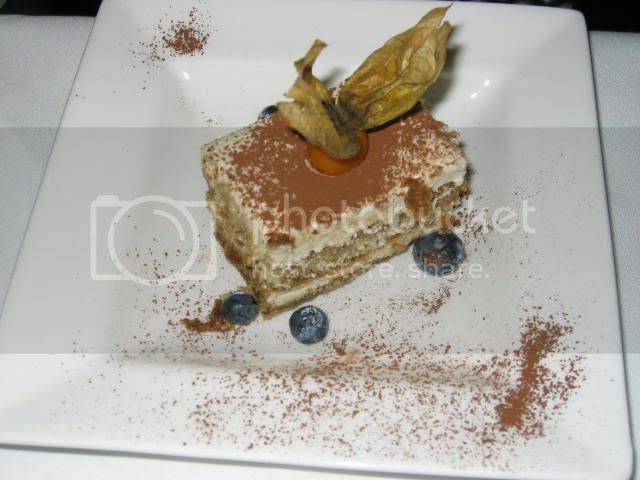 As you can see, the chef at La Braceria took some liberties with this dish that "cannot be improved upon". These included liberal sprinklings of salt, pepper, rosemary, and cooking over a grill that was much hotter than the one specified by Dario. Still, it was looking and smelling mighty good on that grill, I can tell you. The finished product assuaged all worries; the meat came out perfectly rare and utterly delectable. The absence of marbling turned out not to be a significant problem, since it was cooked rare, the meat was tender and juicy. The outside was seared quite a bit, and the contrast between the charred exterior and pink interior was quite sublime. Still, I did think that in terms of taste, it wasn't exactly an explosion of delightful oral pleasure. But never look a gift steak in the mouth, after all. Food was generally pretty good, though they mucked up one of the dessert orders, which was meant to be a molten chocolate cake but came out looking more like a souffle. The ambience was fine, as befitting a modest Italian eatery, with one big drawback: certain seats suffer from a chronic lack of ventilation. I was seated against the wall initially, but it was so stifling I became increasingly restless and had to change seats eventually. As for service, the food took much longer than I thought it had any right to, and our water glasses were sitting around empty without being refilled on far too many occasions. Carnivores have it tough in Singapore. Good meat can be really hard to find, and if you rely on supermarket-bought meats you're paying premium prices for inferior stuff. Thankfully, there are glimmers of hope in an otherwise bleak landscape. Calling all fellow meat-lovers, share your knowledge of good retailers on this otherwise vegetarian island! After dinner at My Choice Chinese Cuisine, my sister and I espied an Espirito Santo outlet just nearby, and decided to walk in to take a peek. Now, Espirito Santo isn't new; it's about two or three years old, at least, but they did recently open a new outlet in River Valley Road (their other one is in Thompson). Although the store had closed for the night, the man behind the counter very kindly welcomed us in to take a look around. While I didn't get to take a very good look at the meats on display, I was pleased that hygiene standards were well-maintained, there was no lingering smell of blood that I've come to associate with The Butcher in Holland Village. Prices didn't seem like bargains, but they didn't seem outrageous either. Espirito Santo also functions as a deli, selling things like hams, cheeses and sauces, rather like Culina or The Lazy Gourmet. What I was very impressed with was the level of service. At the end of a long day, probably eager to go home and in the middle of storing all the meats, the guy who attended to us still managed to be cordial, friendly and helpful at all times. He very graciously offered us the services of his staff and his cutting machine to help us slice a slab of uncut steak my father bought in Australia some time back. If nothing else, Espirito Santo gets top marks for service. One good turn deserves another, so I promised to blog about the butchery. I think I shall buy something soon, and do a comparative study of Espirito Santo, The Butcher, Swiss Butchery, and Indoguna. Anyone wants to take part? I like meat, but the thought of sampling from four different butcheries is a little daunting. The thing I found a bit odd though, is that Espirito Santo has this tagline: expat-owned butchery. It's almost as if their meat is guaranteed to be better because they're not local. I didn't manage to buy any meat from them, but I did go back to cut my meat, and service was every bit as friendly and personable as I remembered it. I did buy some mushroom sauce from them, as well as some herbed butter. Unfortunately, the mushroom sauce was quite dreadful, and nothing I would ever recommend anyone buying. 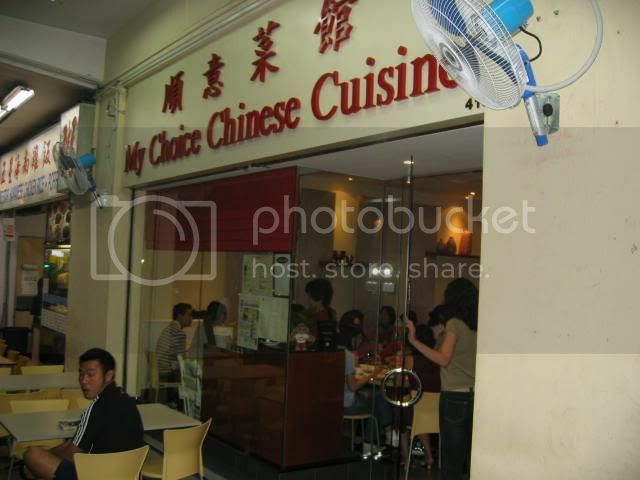 Why is it perfectly acceptable for French and Italian restaurants to give themselves French and Italian names, but Chinese retaurants have to give themselves anglicised names? Okay, someone just gave me an answer...something about French and Italian words being intelligible to English speakers. Anyway, my sister and went to have dinner at a new find of hers; My Choice Chinese Cuisine located in River Valley Road is the latest thing in small chinese eateries that are catering to a growing demand for chinese meals that are quick, filling, and can be enjoyed among friends for a fraction of the cost of most large meals. 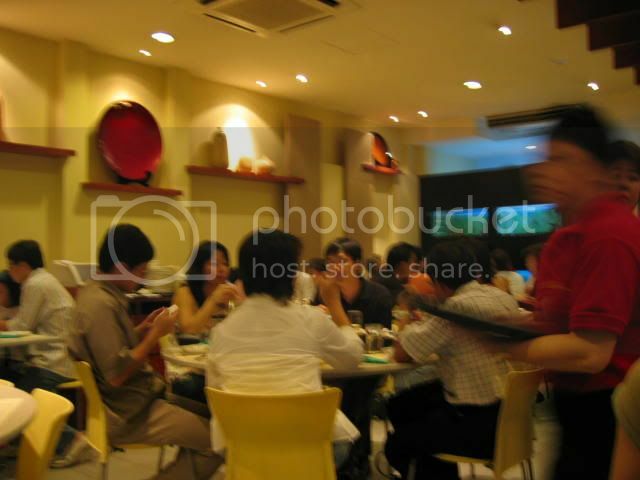 It's actually a pretty casual kind of place, situated next to two Hainanese chicken rice sellers. Thankfully, casual doesn't mean no air-conditioning, otherwise they wouldn't have been quite as crowded as they were that night. And they were really crowded. Clearly either the food was really good, prices were really low, or a combination of the two. I actually thought the food was good but the prices weren't, but you'll read more about that later. Reservations are highly recommended if you're thinking of heading there for dinner. It does get kind of boisterous, and you may have to raise your voice a bit to talk, but at least there were no crying babies. If you're looking for a genteel, clinking of teacups sort of quiet dinner, then you're in the wrong place. Service is pretty zippy here, our food arrived within about ten minutes of us placing our orders. Strangely the whole place is staffed by waitresses - I saw no men serving at all. My sister was adamant that we had to order the deep-fried egg plant with pork floss ($10), which I didn't think was that great (3/5), but she insists was extremely good the last time she had it. 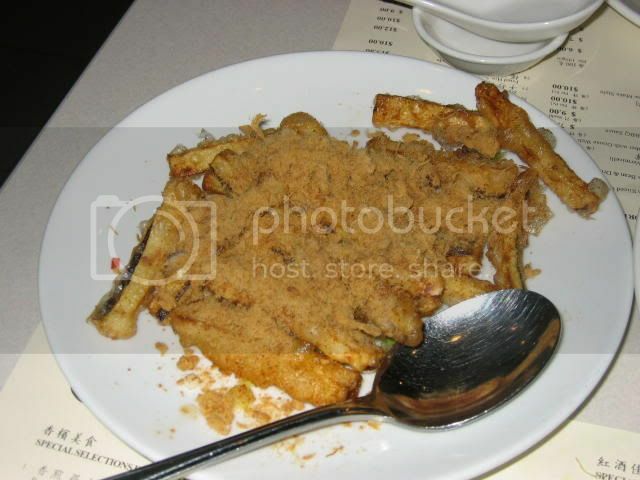 Maybe I just don't like fried eggplant...tasted a bit woody. 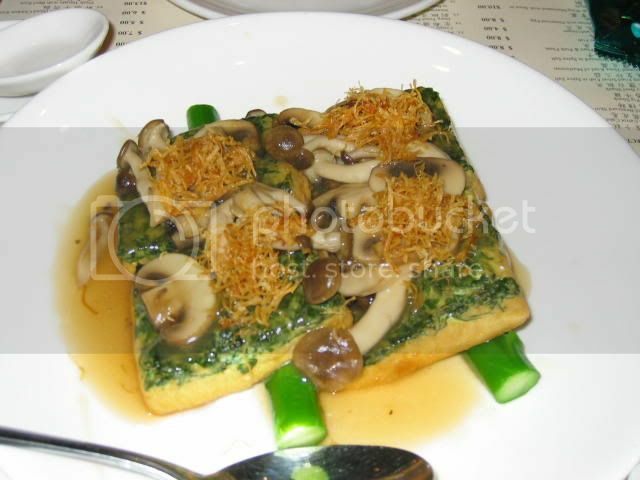 Next was the beancurd stuffed with vegetables (I think it was spinach) and served with asparagus and mushrooms ($14). Now this I quite liked (4.5/5), the beancurd was silken smooth and the spinach added a delightfully different dimension (ooh alliteration), complemented by the thick, gooey sauce and mushrooms. 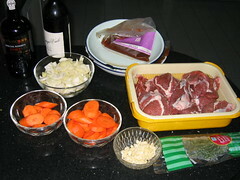 My sister and I shared an order of braised beef cheek ($18), which was part of the inspiration for my braised veal cheeks. 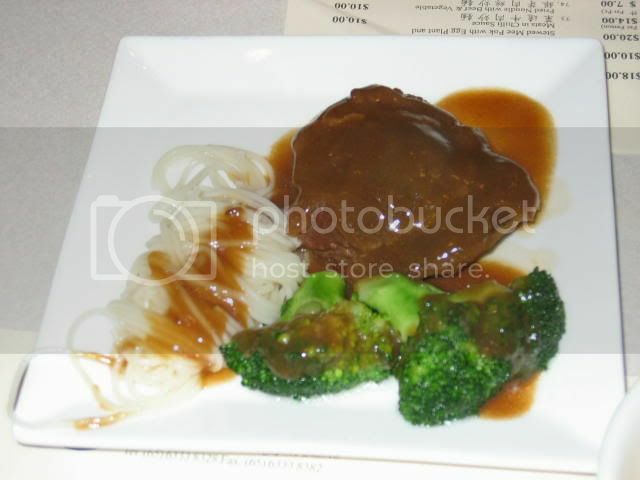 The cheek was served with broccoli and glass noodles, and was actually pretty good (4/5), which was probably why I was encouraged to serve cheeks for my dinner. My Choice is not a bad place to come for a quick dinner, especially if you're tired of the slow pace of most higher-end Chinese restaurants. My only gripe is that prices aren't exactly cheap, though, to be fair, the final price tag was about $30 per person, much less than what you'd probably have to pay at most formal restaurants. Service is blazing; our dinner was over in all of thirty minutes within placing our orders, which was fantastic. I am sometimes asked how I decide upon what food to serve to my guests. There is a simple answer to this: I don't. Usually, the decision is made for me, through various circumstances. In this case, I was sitting around scratching my head wondering what to serve for a main course. On my table, it had to be meat, no questions about that. But what kind of meat? Beef? Lamb? Pork? Quail? I flipped through the Indoguna catalogue, and discovered that only a few items met my budget requirements, and out of these, I decided I wouldn't mind trying my hand at cooking veal cheeks, even though I'd never attempted them before. Now, when you think veal cheeks, you think braised, but the trouble was, I'd never braised anything before. Not vegetables, not eel, and not veal cheeks. Still, once I had Googled a suitable recipe, it didn't seem very difficult. 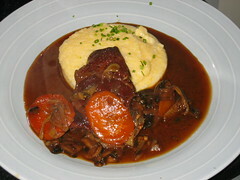 The original recipe also included bacon, rather like cooking coq au vin, but I decided to dispense with that this time. 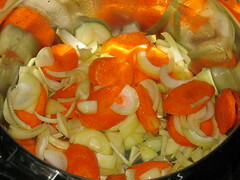 In a deep pot, saute the onions and carrots with some olive oil, until they're nice and soft, about 5 minutes or more depending on how you've cut them. 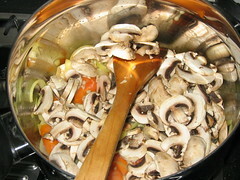 Add the garlic and the mushrooms and continue to cook. Personally I'd add the garlic even before the onions and carrots, but it doesn't really matter. Make sure nothing burns as the mushrooms are cooking. It should only take another five minutes or so for the mushrooms to become nice and brown all over, whereupon they'll probably start exuding some juices. Deglaze with Madeira (I used port since I didn't have Madeira handy), and cook for 1 to 2 minutes, allowing some of it to evaporate. 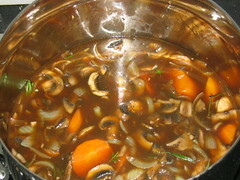 Add the veal stock and the herbs, and bring the whole thing to a boil. Once it's boiling, turn it down to a simmer. Season the veal with salt and pepper and add it to the simmering liquid. The liquid should just about cover the veal. If it doesn't, add the red wine. 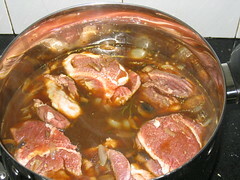 Simmer, covered, until the cheeks are tender, about 1 - 2 hours. It's quite hard to overcook when braising and stewing, so just check once in a while after an hour and turn off the heat when you're satisfied. Make sure to stir the bottom occasionally, so that nothing burns. Don't worry if it seems like the cheeks are not getting soft; by the time you fish them out after two hours, if they still aren't tender, then you started with rocks. Again, served with polenta, and again, the polenta didn't turn out very well. If anyone has a good polenta recipe, I want it! 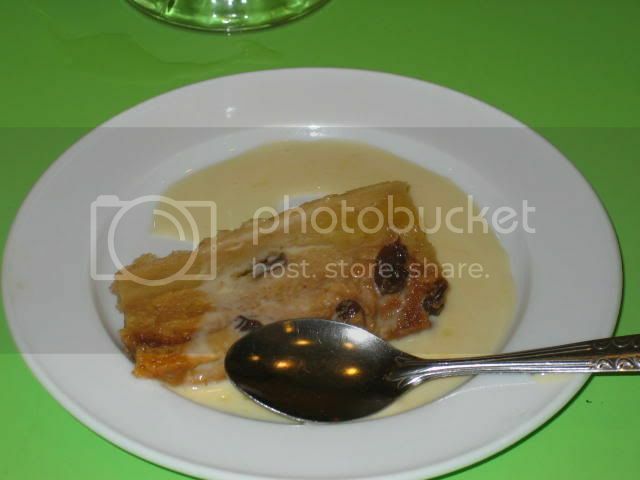 Vichyssoise is a classic French soup, beautiful in its pure whiteness and hearty in its flavour. It's made from potatoes and leeks. If you don't know what a leek is, please find it here. Leeks are closely related to onions, but have a much milder and more complex flavour, which make them perfect for soups. In Singapore, leeks are much cheaper if bought from the wet market, so try to avoid getting them from supermarkets, where they can cost $1 per 100g, which is criminal. This recipe comes courtesy of Anthony Bourdain, and is one of those rare recipes that actually works just about perfectly. No mise en place picture for this recipe; I was in a bit of a rush and forgot. Use your imagination. Generally, only the white parts are mild enough to use, but a little bit of green is forgiveable. Just a bit though. 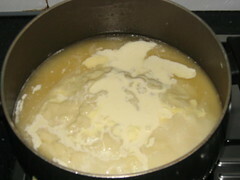 In the large, heavy-bottomed pot, melt the butter over medium-low heat. 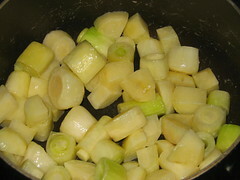 Once the butter is melted, add the leeks and sweat for 5 minutes, making sure they do not take on any colour. Add the potatoes and cook for a minute or two, stirring a few times. 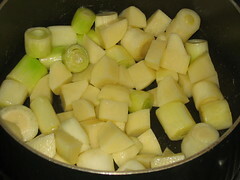 Once your spuds and leeks are glistening and slightly softened, they should look something like the ones above. 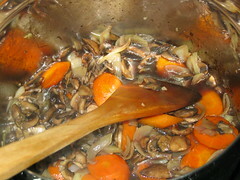 Stir in the chicken stock and bring to a boil. Reduce to a simmer. 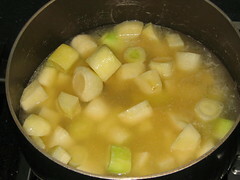 Cook on low heat, gently simmering, for 35 minutes, or until the leeks and potatoes are very soft. Allow to cool for a few minutes. 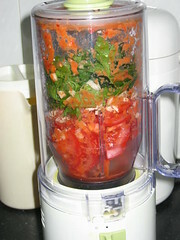 Slowly, and in small batches, puree the soup at high speed in a blender. 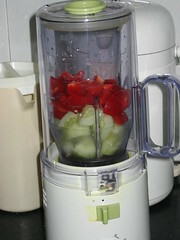 Do not fill the blender more than halfway-up each time. I forgot to take pictures of this process, but really, you don't need to be a rocket scientist to figure it out. 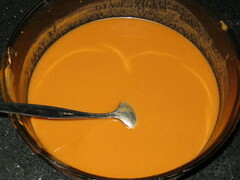 When everything is blended, return the soup to the cooking pot and whisk in the cream and the nutmeg. Season with salt and pepper. 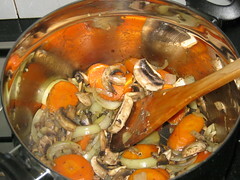 Return to a boil, reduce to a simmer, and continue cooking for 5 minutes. You can thin out the soup with a little additional stock at this point, if needed. 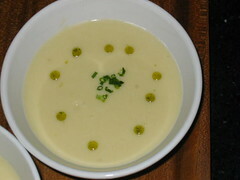 Now, vichyssoise can be served either hot or cold. You may serve it now, hot, and it'll be good, but you can also serve it cold, and it'll be much, much better. If you are going to serve it cold, here are Bourdain's instructions: Transfer the soup to a mixing bowl and chill over an ice bath, stirring occasionally. When the soup is at room temperature – and only when it is at room temperature – cover it in plastic wrap and put it in the refrigerator overnight, or until cool. When ready to serve, check the seasoning, sprinkle with freshly cut chives, and serve in chilled bowls. As easy as easy can be. And as Anthony kindly reminds us, This is a soup that does get better over time. But keep it covered with plastic (not foil) in the refrigerator, as it will pick up other tastes. And never put it into the refrigerator while still hot. Finally found some time last weekend to cook and have dinner. Feeling rather inspired by the French trip, I decided to try my hand at a tomato gazpacho. There was just one slight problem: I had no idea how to make one. After looking around, I found an easy-looking recipe. Actually, tomato gazpacho is not very difficult to make; you just have to make sure your ingredients are nice and fresh, no preserved stuff. 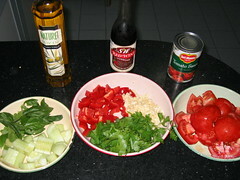 It is indeed unfortunate, though, that something as simple as fresh ingredients are so hard to find in Singapore. The tomatoes you see above, vine-ripened, are still not as sweet and succulent as one would like, but they'll still set you back about $2 each, so you'll want to budget properly. My main problem was that I only wanted enough gazpacho to fill five shot glasses, and had no idea how to reduce the recipe correspondingly. In the end, I ended up with about ten times as much gazpacho as I needed. If you do feel like serving gazpacho, keep the portions small (as in an amuse-bouche); it's a bit spicy to serve as a full soup course. There really isn't much skill involved in this recipe. It even lends itself to being made a day in advance. If you muck it up, then there is no hope for you, really. Having said that, I did manage to muck it up slightly. If you do make the recipe in advance to chill in the fridge, be sure to leave out the garlic or use very little (even less than the stated amount above). This is because garlic intensifies as it sits and will overpower the rest of your gazpacho. I read this in some other recipe and ignored it, but it turned out to be one of those pearls of wisdom that are actually true, so ignore at your own peril. Okay, so place your cucumbers, peppers, tomatoes, onion and garlic in a food processor or blender and pulse the hell out of everything till you get liquid. 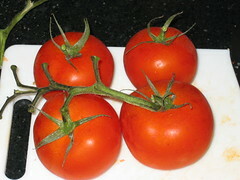 If it's too dry, add some of the tomato juice or olive oil. 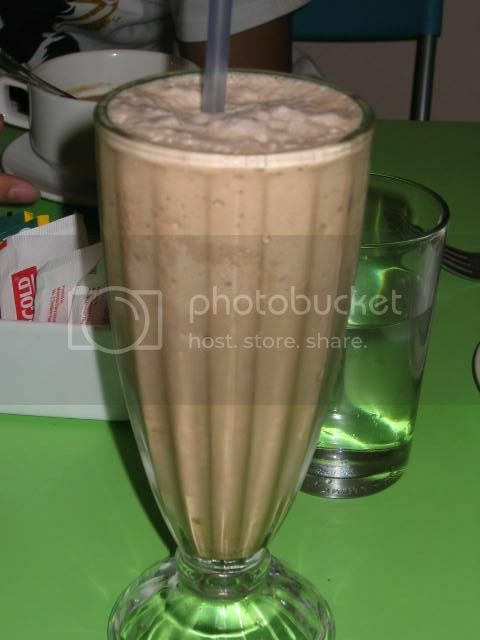 Keep adding the other ingredients till everything has been smoothly blended. If your blender is not very big, then for mercy's sake work in batches. You can mix the separate liquids you obtain in another bowl. At the end of all that blending, you should obtain something that looks roughly like the liquid in the bowl above, depending on how far you've deviated from the recipe and taken your own liberties. Now all you have to do is strain the liquid repeatedly (I strained at least three times) to rid it of all that unpleasant pulp, pith and seed residue that the cucumbers, peppers and tomatoes generate. Your gazpacho should be as smooth as possible. Once that's done, have a taste. Gazpacho is meant to be pretty intense, but if it goes straight to your head, chuck it into the fridge with a couple of ice cubes to dilute it. Serve chilled at the dinner table, to be drunk as quickly as possible. P.S. if anyone has a good recipe for clear gazpacho, I want it! Continuing with the Italian theme, we were looking for a place to have lunch on Saturday, when the weekend Business Times fortuitiously featured a writeup of some new eateries that have opened. One of those featured, L'Antipasto, was really close to home, and looked like it offered very lunch-friendly fare, so we decided to give it a try. 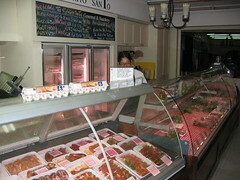 L'Antipasto also includes a small deli concept, where you can purchase hams, tomatoes, and assorted Italian goodies. 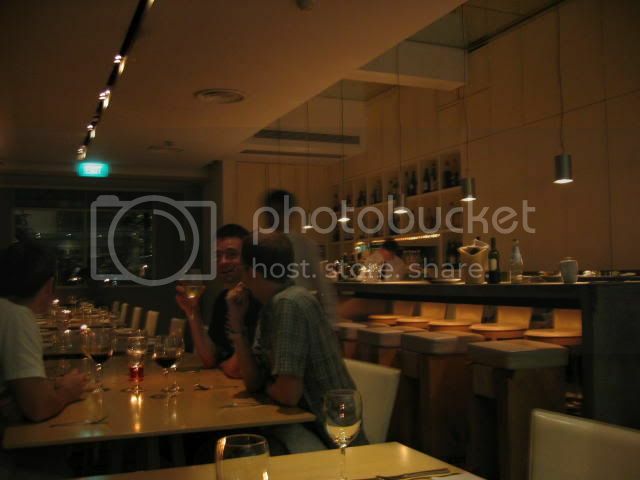 A modest dining affair, the restaurant can probably comfortably seat about thirty people, and the interior is well-lit. 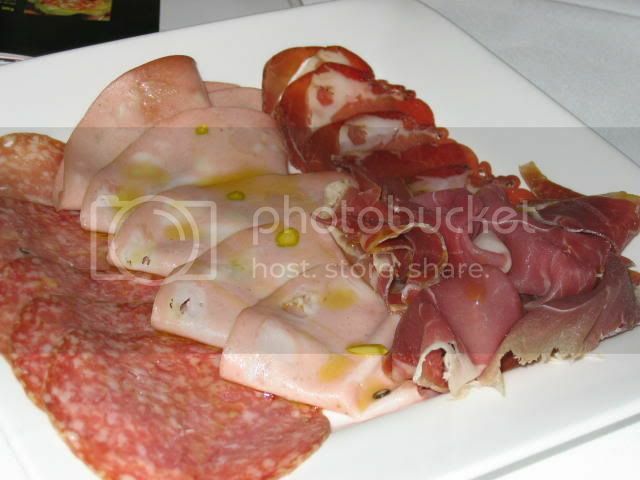 We decided to start with a selection of Italian cold cuts, mostly ham and salami with a dash of olive oil. The cuts were pretty good (3.5/5), but they could have been served even more chilled. We also decided to share a plate of bruschetta. I've found that it's always the simplest dishes that are paradoxically the most difficult to do well. Few places serve a truly exceptional bruschetta, hence I was pleased to find that L'Antipasto was one of the few places that took their bruschetta really seriously (4.5/5). It was quite excellent, the tomato concasse full of ripe, full-bodied, explosive cubes of sweet tomatoes, the bread just the right state between crusty and rock-hard. I think I could have made an entire meal of those little buggers. 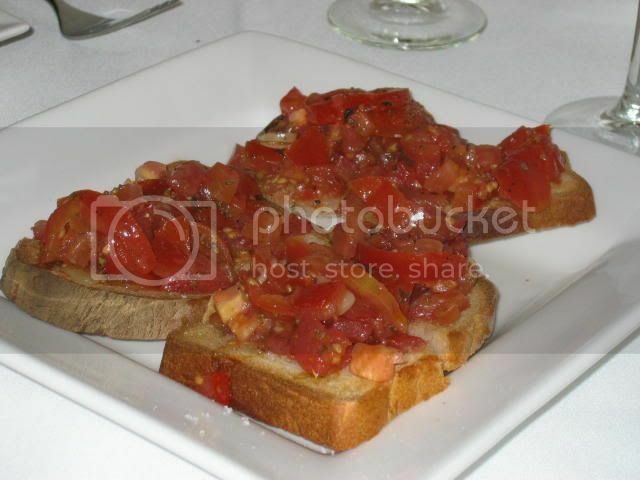 At this point the chef came out to have a chat with the customers, and when we praised him on the bruschetta, he told us it was because the tomatoes were specially imported from Italy, and very kindly brought out two samples for us to try. The ones on the right are Italian tomatoes whose proper names I have forgotten, and the ones on the left are Buffalo Heart tomatoes. 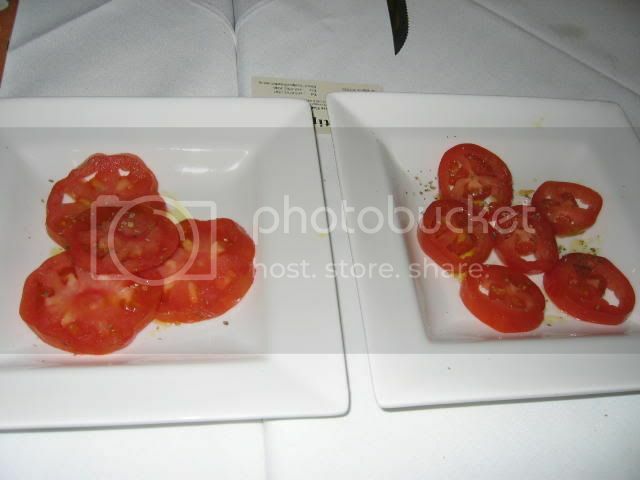 It's interesting how different in texture and taste they were; the small tomatoes were clearly meant for eating, as they were sweet and palatable, while the buffalo hearts were much more grainy and not easy to eat in their own right. I decided to have the special pizza set lunch that the restaurant was offering on weekends; a pizza and a dessert of the day for $18. 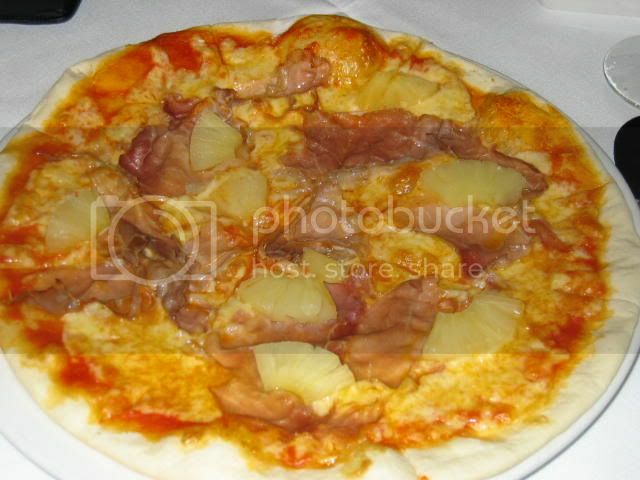 The only pizza that looked fairly appetising was the Hawaiian, but the end-result came out rather disappointing (2/5). The ingredients were not particularly generous, and the oven was either not hot enough, or the pizza wasn't placed in it long enough, because the pizza crust was still rather doughy and floury. Usually I don't finish the crust because it fills me up, but this time I didn't eat it because it was quite awful. You can see how pale the crust looks in the photo; not a hint of charring at all. 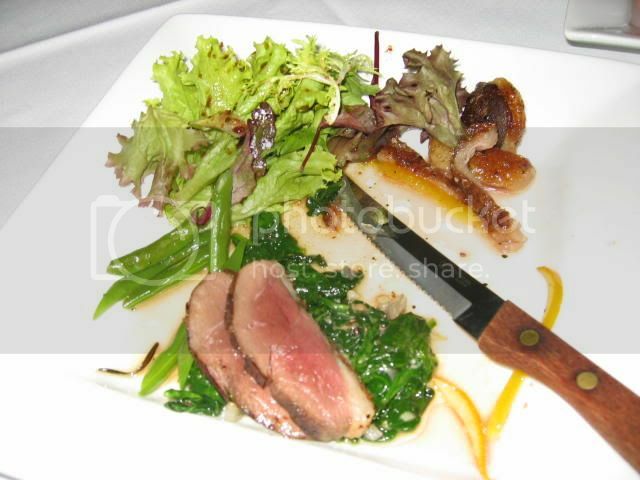 My sister had the lightly-cooked duck breast, which was very good, and I'd happily recommend it. The pizza though, you could probably do without. Lunch ended with a tiramisu, which is supposedly one of the must-trys at the restaurant. As tiramisus go, it was pretty good (3.5/5), though I did think it could have benefitted from a bit more coffee. L'Antipasto suffers from quite a few teething problems at the moment, most notably the fact that they run out of food exceedingly quickly. In the time that we were there, they informed us that they were out of two desserts, and one main course. This was on a Saturday afternoon, which I think speaks quite ill of their procurement strategy. Also, some of their dishes are a bit hit and miss. Given this, prices should be lower in order to compensate and attract more customers to an otherwise unknown location. Italian restaurant binge this past week. On Thursday, May and I went to have dinner at Da Paolo il Giardino, part of the Da Paolo chain that spans three restaurants and one pizza bar. 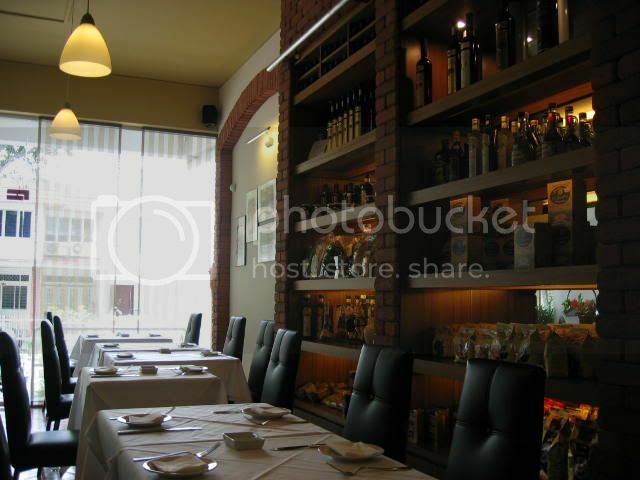 In terms of location, ambience and presentability, Da Paolo il Giardino certainly has a lot to offer. 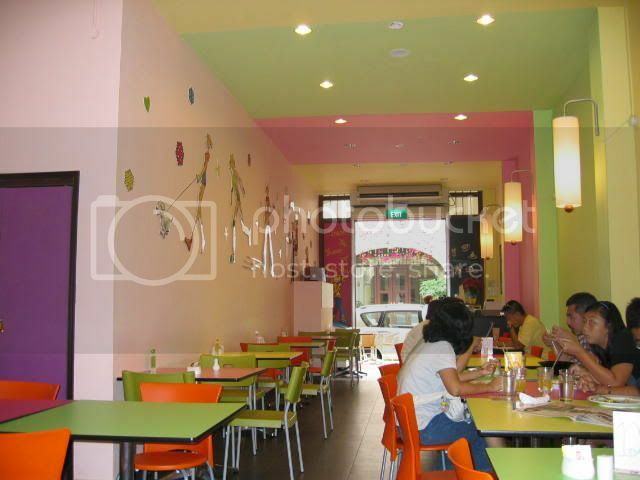 It's located squarely in Bukit Timah Road, very conveniently accessible by bus or car (no train, sorry), and offers both indoor and al fresco dining. I cannot eat without air conditioning in the this weather, so we sat indoors. It rained heavily that night, so it's a good thing that we did, too. 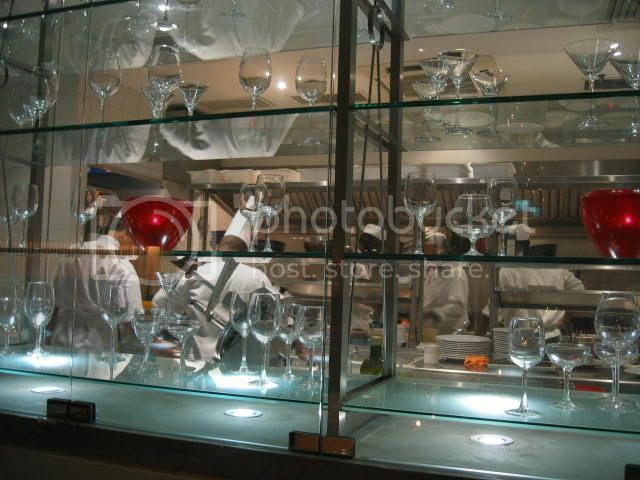 The kitchen is a see-through concept, so if you sit near the back of the restaurant, you get to see your food being prepared, and if they really do spit in food you send back. 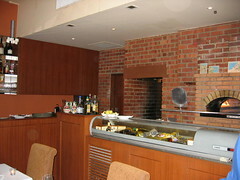 The restaurant also features a classy bar counter and nice, clean white tables and chairs. 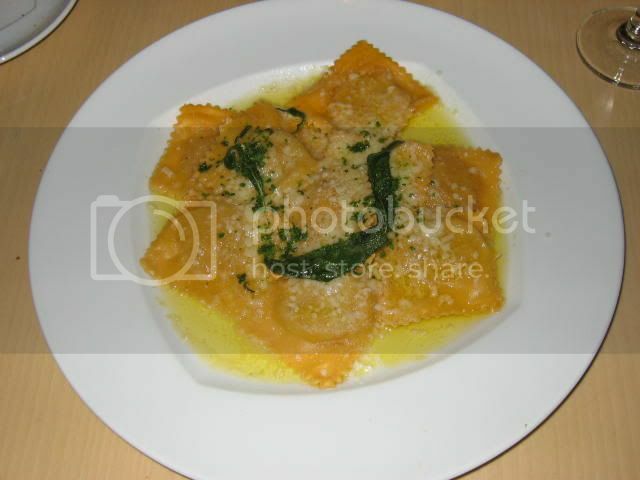 I decided to go for the ravioli ($18) stuffed with veal and ricotta, tossed in butter and sprinkled with grated parmesan. 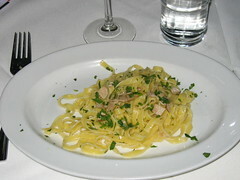 Now, when they say tossed in butter; they're not kidding - my pasta was served in a pool of butter. I did think olive oil would have been more appropriate, and in a much smaller quantity. Nonetheless, the ravioli was very good, though they should have been more generous with the stuffing (3.5/5). For dessert, we couldn't decide between the panna cotta and the chocolate cake ($8), so we decided to ask a waiter for recommendations. 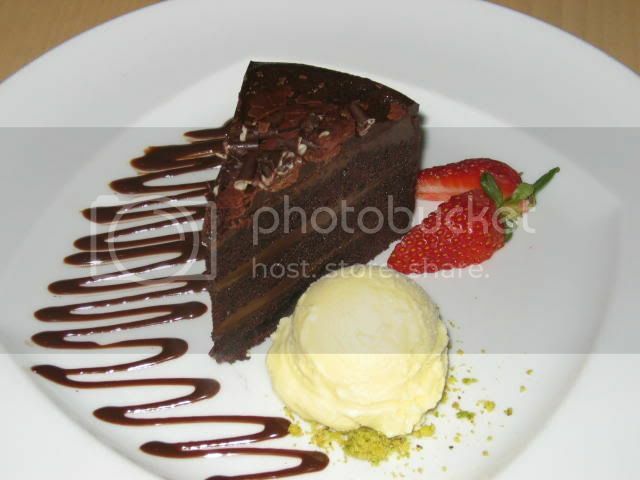 He very helpfully suggested the chocolate cake, because it came with ice cream. So between one dessert at room temperature and one cold dessert, we'd be better off with the cold dessert (no really, he actually said this). So all right, we decide to have the cold dessert. Personally I think it's never a good idea to order chocolate cake for dessert unless it's the molten variety, because they inevitably turn out dry and not very nice. So it was with this cake (3/5); merely passably mediocre. In terms of location and ambience, no complaints from me. Service is decent, I suppose, but not spectacular. The food is satisfying, and you're unlikely to be disappointed, but don't expect to be surprised, either. Prices are pretty much mid-range, with desserts being especially value for money.